​There are many ideas here. Please don’t feel you have to do them all right away, but we feel it’s important to provide you with as many ideas as possible to help you find your dog. We are an all volunteer group and all of our services are completely FREE. First, click on the banner above to fill out a lost dog form so we can help. This is free! Download free flyers in several styles, including Spanish. Next, follow the tips above in the “Five things to do if you have lost your dog” photo tip. Put out food and water, and a scented item where your pet was last seen - their bed/ favorite toy, an unlaundered article of your clothing, a towel that’s been rubbed on their favorite dog buddy. Don’t put out dry food; use smelly food to lure them in –canned dog or cat food, Solid Gold Tripe, or tuna! Check the Helping Lost Pets database to see if your dog has been listed as found. Go to www.HelpingLostPets.com and click on “Search Our Map”. If your dog isn’t listed there, please register if you haven't already done so by clicking on “Report A Lost Or Found Pet”. This will enter your dog into a map-based searchable database and generate flyers for you to use. All of our services are completely free. Please use a clear photo that shows the dog’s entire body, face, and any unusual features or markings too. Use the very best photo possible! A good photo may be the difference between someone recognizing your dog and being returned to you - or not. If you have several photos that show your dog from different angles, you can use Pixlar Express to create a collage. Please crop out any distractions such as people, children, furniture and other pets. We will not post photos with children or of chained dogs. We have found that photos of sleeping pets are not very good for getting people's attention, so use as a last resort. We understand you may not have the ideal photo, but these are guidelines to help you get your pet Back Home. If you need help, please email us at LostDogsFlorida@gmail.com. If your dog is micro-chipped: Contact the microchip company to alert them that your dog is missing. Be sure they have your current phone numbers. Ask them to notify you immediately if your dog is scanned. Veterinarians are not required to notify you. If your dog is wearing a rabies tag: Contact your vet/shelter (whoever administered the vaccine) to notify them that your dog is lost. Make sure they have your current phone number. Go to the shelter. Bring along a clear and recent photograph of your dog (you can use the flyer your created through Helping Lost Pets). Don't assume the shelter will call you if your pet is found. Your dog may look different after a few days outside and not resemble the picture you supplied them. You'll recognize them, but a stranger may not. Check back daily - if at all possible, in person. Check shelters in surrounding counties too. While we work closely with shelters/animal control, we are not affiliated with them, so it's very important that you contact them as soon as possible. Flyer, Flyer, Flyer! This is the most effective tool to find a lost dog! You can print black and white flyers if you are watching your pennies. There are several different flyer templates to choose from through HelpingLostPets.com and you can print full page flyer or four flyers to a page to save on printing costs. You may choose a template with pull-off tabs with your phone number to post in businesses so people can take your contact information with them. Available in Spanish too. Knock on doors, hand-deliver a flyer to each household in the area your dog was last seen. People are more likely to remember your dog and get involved to help if they have talked with you. 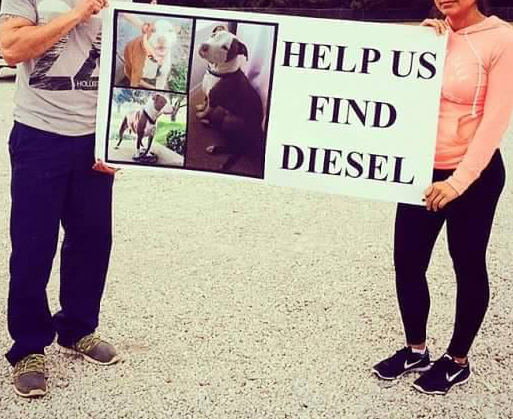 Leave a flyer with them so they have a photo and your contact information handy if they see your dog. Suggest they take a photo of the flyer with their smart phone so they always have the information with them. Be sure to tell people not to chase or call your dog, which can cause them to run farther from where they were lost, or run into traffic! Do not leave flyers in or on mailboxes, as this is illegal and you may be fined! Tape flyers to the front door if nobody is home. If you have people helping you: Have them help you distribute flyers. A lot of commotion and people “helping look of your dog” may cause the dog to hide or run. Do not congregate in your driveway or the area he was last seen. If they see your dog, instruct them not to chase or call them, but to call you instead! Your scared, lost dog may be so overwhelmed that they are leery of people – even you! It’s very important not to call or chase them as this may make them run farther, become more skittish with people, or run into traffic! For this reason, we strongly suggest NOT to offer a reward, which can encourage people to chase or call after your dog! Missing Pet Partnership has a short video that's especially important to watch if you have a shy or nervous dog. "Calming Signals Panicked Dogs" . No Dog About It: "Loose Dog? Don’t chase! Stop, Drop and Lie Down"
Lost Dogs of America: "We Don’t Recommend Offering a Reward for Your Missing Dog"
Check shelters in the surrounding counties too. Pets travel farther than you think! Good Samaritans often pick up lost pets and take them to the shelter that’s closest and most convenient for them. The shelters are run separately, so you'll need to contact each one. Pets are only kept for a mandatory hold period – often only several days. After that, if your dog doesn't have a microchip that can be traced back to you, they are either put up for adoption and adopted (permanently) by someone, transferred to a rescue, or possibly even euthanized. Finding your pet within a few days is critical! Continue to monitor shelters until your dog is home - sometimes dogs are taken to the shelter weeks, months, even years after they are first lost. When we receive your registration we will post your dog's flyer to our Facebook page. Please “tag” yourself or comment under the post to ensure you receive updates from Facebook. Often someone who has information about your dog will post a comment instead of contacting you. It is your responsibility to monitor your dog's post to watch for any new information from fans. Also check your e-mail regularly (spam box too) for comments generated through the Helping Lost Pets system. Watch the Visitor Post Section on our Facebook page. Many reunions are made here so check here often. Change your outgoing message on your answering machine/voicemail asking for the date, time, and location that the caller may have seen your missing dog. Which direction was your dog headed? Was the dog alone or with another dog or person? Was the dog walking or running? Injured? Ask them to leave their name and phone number in case you have questions. Please see: "Why Voicemail Becomes Very Important When Your Dog is Lost". Monitor Craigslist: Many people who find a lost pet will place an ad on Craigslist under the "Lost and Found" section, so check there for THEIR ad in addition to placing your own ad there. Also watch under the “Pet Section” to make sure your dog isn't being sold or re-homed by someone. Check postings that sound similar to your dog. Many people aren't familiar with breeds and one person’s medium dog is another’s large dog, etc. A picture is worth a thousand words! Click here for a list of Craigslist cities in Florida. Setting your view to "gallery" allows you to see large photos without having to click on each listing. You can sign up to receive e-mail alerts from Craigslist for possible matches for your lost dog. See the upper right-hand corner of the photo below. Take sheets, pillow cases, worn socks or shirts to leave a scent trail for your dog. If the person the dog is most bonded to wears perfume or cologne everyday and this is known as your scent then spray a little on the items placed outside. Also leave the dogs bed or piled cloths in a safe dry area for them in the event they come back in the middle of the evening, check often throughout the night. Also if you do not have other dangerous animals then leave out wet stinky cat food. Intersection alerts: The sign below is a great way to reach a lot of people at a busy intersection, but it should include a phone number so people can contact you. If it's safe, have a second person carefully hand a mini-flyer with your dog's photo and your phone number on it to each stopped car. 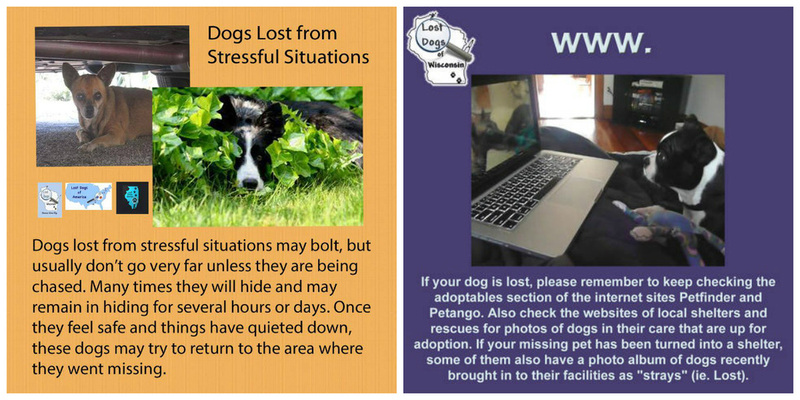 These mini-flyers can be made at www.HelpingLostPets.com/mypets. Please remember safety first! Another option to going door to door with flyers: The USPS Every Door Direct Mail® costs 14.5 per flyer. You pick the neighborhoods you want to reach, and the mail carrier takes them to each home while delivering the mail. Give flyers to delivery people since they spend considerable time in the area - UPS, FedEx, your mail carrier, pizza delivery, even bus drivers! 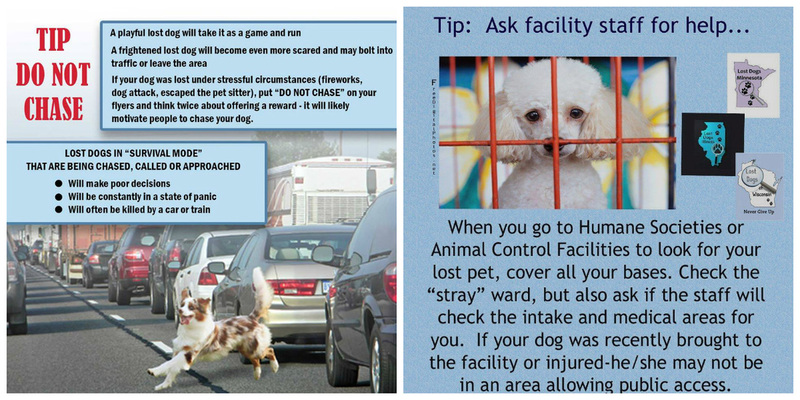 Take flyers to vet offices, groomers, dog parks, pet stores, grocery stores, farmer’s markets, events, gas stations, etc. Anywhere there are people! Talk to kids in the neighborhood. They spend more time outside and can often help. The more people that know your dog is lost, the more likely they'll be reunited with you. School children are very observant! Put up signs (like garage sale/for rent signs) that say lost dog, a picture and your phone number in front of your house or the area they were lost. The person who found your dog may be trying to find you. Put the flyer/photo in an upside down sheet protector to keep it from getting wet. Tag your car: Using the type of marker designed for writing on car windshields, write LOST DOG, breed, color, and your phone number. The people most likely to have seen your pet live in your neighborhood. Monitor local rescues, shelter pages, Craigslist, and online sale pages on Facebook to see if your dog has been placed for adoption, being sold, or rehomed. Stolen: We discourage advertising your missing dog as "stolen" because it makes it less likely for your dog to be returned to you. Even when a dog is known to be stolen, we still treat them as lost. Thieves sometimes let them go, or the dog gets away and then the dog truly IS lost. If a dog is advertised as stolen, the person who finds them may be reluctant to return them to you because they’re afraid of being accused or don’t want to get involved. Also, if people see your dog running loose, they will assume it’s a different dog, since they believe a stolen dog will be in someone’s possession, therefore they won't notify you or confine the dog when they see them. Click here if you believe your dog was stolen. Rewards: We strongly suggest not offering a reward for a lost pet because this encourages people to chase or call after them. One of the biggest threats to a lost pet is being chased into traffic (often by a well-meaning person), or running farther from their home. Because we don't want to endanger your pet, or encourage other people to offer a reward, we aren't able to post a flyer that says reward on it. After you have found your pet: When your pet comes home, please use this link to update your pet’s status: www.HelpingLostPets.com/MYPETS . This allows our volunteers to focus their efforts to help others with lost pets. We appreciate details on how your dog was found as this helps us gather information about which strategies are most successful. We use this to develop better methods for finding other pets and share this with shelters, rescues, and animal control facilities. Your success story also provides hope for those who are still searching for their dogs, and encourages them to continue searching. Need more help? We hope these tips are helpful, and that you are reunited with your dog very soon!! If you have questions or we can help in any way, please contact us at LostDogsFlorida@gmail.com. About Lost Dogs Florida We are an all-volunteer group dedicated to reuniting lost dogs with their families. This service is provided free to dog owners, shelters/rescues, and animal control professionals. Increase awareness that often a lost dog doesn't need a new home; they just need help getting back home! Webinar sponsored by Lost Dogs of America and ASPCAPro on how to find a lost dog. "Fireworks and Reuniting Lost Dogs With Their Families" An informative video for finding your lost dog at any time of year. The Missing Pet Partnership has a short video titled "Calming Signals for Panicked Dogs" if you have a shy or nervous dog. It's not uncommon for a lost dog to go into "survival mode" causing them to perceive people as threats - even their beloved owner. "Feral, survival-or-flight-mode, what does that mean?" from Lost Dogs of America.